Booger came to me as a basket case. I landed a very tired, very green two-stroke moped at sixteen years of age. Being sixteen, I cut Booger's muffler off and ran an open pipe in an effort to make it sound more authoritative. That modification was neither intelligent nor fruitful, but it was educational. As my years of wrenching piled up, I learned a few things about exhaust work, and I'd like to share one with you: Changing your muffler can yield a lot of smiles in exchange for a reasonable amount of your hard-earned dollars. Also called a slip-on exhaust, a muffler-only exhaust offers many of the advantages of a full system at a price that is easier to swallow. Slip-ons usually offer great looks and killer sound when compared to an OEM system. I don’t care if you’ve got a pancake motor, a triple, or an old two-stroke screamer, mufflers tend to enhance the “voice” of your motorcycle, and plenty of riders find them a bit more visually appealing, too. With many higher-end, sport-oriented mufflers, you also frequently enjoy a weight reduction, due to more exotic materials they often incorporate. Sometimes, the tortuous path the exhaust gases take through a factory muffler can also add a bit of weight. Again, this will vary based on the manufacturer and application, but it can be nice to shave several pounds off a bike, especially one that’s a more nimble mount. Before: The stock muffler from a Ninja rings in it at almost 10 pounds. Photo by Lemmy. After: The replacement sheds a significant amount of that weight. Photo by Lemmy. I already mentioned lower price, but one of the other things you’ll save with a muffler-only system is time. I love wrenching, but I love riding more. Muffler installation is usually very easy. Most mufflers are pretty easy to get to. (Except for some of the undertail-equipped bikes. Man, those can be a headache to swap!) You probably have all or most of the tools you need to do this in your toolbox, and the reward is pretty high, considering the minimal time investment you’ll make. So far, I've listed sound, looks and weight savings as reasons people buy an aftermarket slip-on. What about performance? What about some exhaust manufacturers who say you'll gain horsepower? In my experience, a slip-on alone isn't likely to make a noticeable difference, but the right combination of a muffler and other modifications can make a real difference. But that's a more involved topic for another day. This is a reasonably easy project, but knowing what the job entails can make it a cakewalk. The range of tools to remove springs safely runs the gamut, from quick-and-dirty to pro-quality. My favorite one is made of an old T-handle Allen driver, but it works great. Photo by Lemmy. Removing spring hooks: I’ve quickly fabricated make-do tools over the years to do this, and they have all gotten the job done, but an actual, made-for-the-task spring hook tool really is a nice thing to have. I’m as skinflint as they come, but for the few bucks this thing costs, it’s probably a tool worth picking up. Harley and most non-sportbike riders who don't have a spring to deal with can feel free to ignore this tip with extreme prejudice. Many slip-on mufflers are retained by exhaust springs. Photo by Lemmy. Slip-ons not slipping on: Two notes on this. First, not all exhausts truly “slip on.” There are some styles (Suzukis come to mind) where the exhaust actually bolts together at a flanged joint. If you have a setup like this, make sure you have the required gasket before you start taking things apart. Exhaust leaks ain’t cool. My second note on this is that pipes corrode and rust. Heat cycles, moisture, impact, and general wear take their toll. Even though theoretically those tubes just slide inside one another, sometimes they get stuck pretty well and you hafta wrestle them a little bit. This is a delicate balancing act between "gittin' 'er done" and damaging an exhaust port gasket or your engine’s head. Use caution here. Note that this also works in reverse, too. Just because you threw a muffler on and snugged it up does not mean it will be leak-free. Make certain your new performance exhaust has not introduced a leak due to an improperly tightened clamp or sloppy mating surface. Check the system for leaks after installation, but watch your mitts, because exhausts get searing hot very quickly! Photo by Lemmy. Popping and lean-running issues: Generally speaking, a slip-on can be installed without needing a tune. Note I said “generally.” Depending on your elevation, bike, other modifications, and a whole host of other stuff, like which muffler you chose, you may still find a need to change up the fueling. Heck, because of emissions regulations, most rock-stock bikes right out of the factory would benefit from a fuel controller or carb re-jet, anyway. Except for a slim minority of cases, most people can get away with an aftermarket muffler without altering the fuel system. If other parts of your bike undergo modification (like later you add some headers, or you have a high-flow air filter) plan on re-tuning the fuel system. Decreased fuel mileage: I cannot tell you how often I have put a roaring muffler on a bike, and the rider comes back to me at some point and says, “Man, I love that new pipe, but I am getting terrible fuel mileage!” Here’s the thing; I have experienced this myself. Theoretically, a muffler should improve your bike's fuel mileage, but it seems as though those of us who looooooove the sound of that new muffler get throttle-happy and start flogging the bike just to hear that sweet, sweet muffler music. Just like in high school, you may find yourself listening to the same record (cassette, CD, MP3) over and over — and loving it. 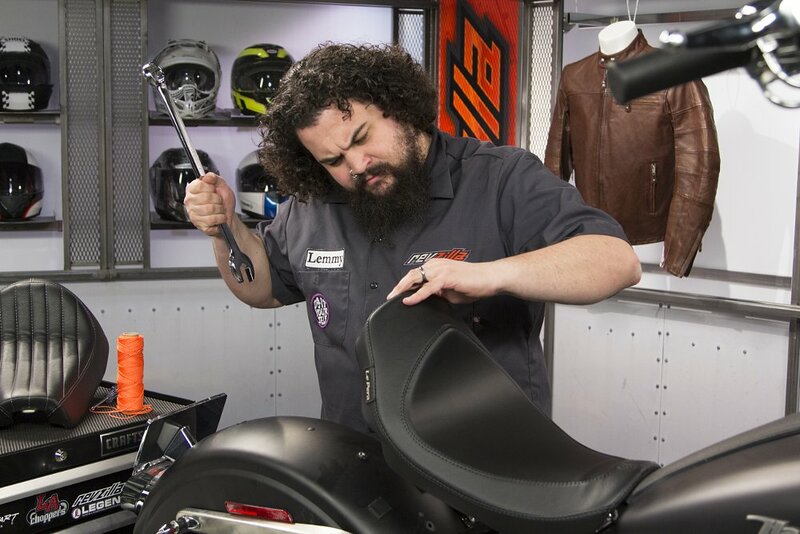 Please, do not let any of those issues stop you from nabbing a muffler for your bike. I really cannot remember a single person for whom I’ve swapped an exhaust who has not come back wearing a huge grin. A muffler is a great first project if you’re wanting to personalize your bike some to better suit your tastes. As always, if you need some clarification on any part of the process, drop a comment in there. Between the ZLA staff and our accomplished wrenchy customers (looking at you, Nick Stolten! ), we can help you get your bike barky.